‘Thicker than Water’ serves as a sequel to 2004’s ‘Arrangements for War,’ and though plot itself becomes somewhat incidental, it provides an utterly engrossing and emotionally fueled chronological finale for Evelyn Smythe, wonderfully rewarding listeners who have come to know and enjoy this fantastic companion. This is a monumental release for Big Finish, and the script takes full advantage of the fact that Evelyn’s eventual fate is still unknown until the end. 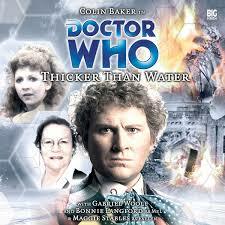 The Sixth Doctor is traveling with Mel at the outset of this story, Evelyn having previously decided to stay on Vilag and begin a life with Rossiter whom she has now married. Evelyn and the Doctor didn’t always have the easiest of relationships, and the script wisely takes the time to resolve many of their underlying issues as well as her heart condition. Surprisingly, it’s the cameo from the Seventh Doctor at the end of this tale that carries the most emotional weight when he tells her that at least a modicum of good has come from their travels together as his companion Hex is Cassie’s son, allowing her legacy to continue. Evelyn’s reaction is pitch perfect and serves as a definitive closing moment for her time with the Doctor. However, the relationship between the Sixth Doctor and Evelyn is captured perfectly here, and it’s abundantly clear just how important each was and still is to the other. Rossiter telling the Doctor how disappointed Evelyn was that he didn’t show up for their wedding resonates deeply, and the Doctor later apologises to her for being so childish and selfish, declaring that he still misses her. Similarly, the flashback scene in which they return to Vilag in which Evelyn is astounded at how easily she and Rossiter picked up where they left off is played perfectly, as is the Doctor’s hasty attempt to hide his sadness about her likely departure. That paired with the obvious happiness the two express when the Doctor returns with Mel speaks volumes about just how strong of a bond they have, and the Doctor pointedly says that this incarnation’s mellowing in behaviour is due to the presence of Evelyn. This is the last opportunity for writers to toy with what Evelyn’s fate may be; following the tragic ending of ‘Arrangements for War,’ much of the script is not full of happy circumstances for her. She is enduring increasingly frequent and terrible headaches and experiencing mood swings as a result, and she cannot find a common ground with Rossiter’s daughter about whether to study or destroy the Killoran technology. The introduction of Doctor Lawrence comes off as a matter of convenience rather than necessity, and his kidnapping of Evelyn because Sophia mentioned that her life would be easier if Rossiter hadn’t married her is a bit suspect. However, it does serve to move the narrative forward and helps lead to the revelation that Killorans are being experimented on and that Evelyn has been given some Killoran DNA. Sophia removing the blood clot from Evelyn and the Doctor sharing some of his own blood to help her with antibodies against the Killoran DNA help to provide a rather upbeat ending after a series of such serious events. With Lawrence seemingly playing the villainous role here, it’s surprising that his death occurs so early on with little consequence other than to allow Szabo to truly step into the spotlight of villainy. Motivated by sheer hatred and revenge against the race that attacked them, Szabo has been torturing the Killorans and experimenting with their DNA since he discovered that they have amazing regenerative and healing abilities. Overall, though, his bigger purpose is to raise questions about Sophia, and it unsurprisingly comes to light that she is for the most part a genuinely good person despite her clashes with Evelyn. If this truly is Maggie Stables’s final performance as Evelyn Smythe, it’s a wonderful one that exemplifies everything that makes her character so memorable and enjoyable. The final scene between the Doctor and her is wonderfully underplayed and in keeping with the tone of their friendship, and it provides a strong sendoff for arguably Big Finish’s strongest creation.